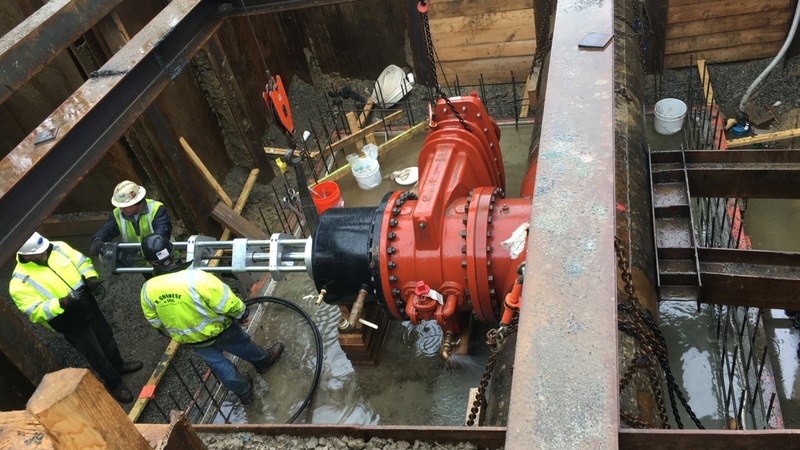 Throughout the winter, we continued to work with DOC on the replacement of valves on the RAS lines in the lower level of the wastewater treatment plant which was in conjunction with the activation of the new clarifiers and other modifications that had been part of the contract work. Between February and April, we installed the set ups for two bagged stops on two more 36″ lines. This time they were oriented to be side stops (at the spring line of the pipe). We also did four 18-inch RAS lines which were again about 15 feet off of the floor and these ones were done on dead bottom of the pipe as was the first 36″ one we did last year. As stated before, with any interior plant work, the majority of the time is spent lifting and positioning the equipment to ensure that everything is lined up perfectly. Again, working with a company that has so many skilled personnel is a joy for us and makes the job go much smoother. Hopefully we will have the opportunity to work with them again.